For those of you who are choir directors, singing with pure, rounded vowels is probably one of the primary things you teach to your choir. It's especially important to teach this to children's choirs and instill good vowel-singing in your singers from a young age. Singing with pure, rounded vowels helps with tuning and intonation. Singing with unified vowels across the choir helps create that sense of choral blend and singing with one voice. Creating space inside the mouth for tall vowel sounds helps create resonance and a warm tone. In this post, I'll review the primary vowel sounds, how diphthongs and triphthongs work, a few common vowel challenges (plus some quick fixes), and a few useful strategies for teaching vowels to your choir. To sing this vowel, bring the middle of your tongue far forward and up toward the roof of your mouth (mid-close). Lips should be unrounded. To sing this vowel, move the middle of your tongue far back and flatten, away from the roof of your mouth. Lips should be unrounded. To sing this vowel, move the middle of your tongue far back and up toward the roof of your mouth (mid-close). Lips should be rounded and protruding slightly. To sing this vowel, move the middle of your tongue far back and up toward the roof of your mouth (close). Lips should be rounded and protruding. *The letter shown in brackets is the International Phonetic Alphabet (IPA) symbol for each vowel sound. In the English language, some words have more than one vowel sound in a row. Here are a few words with diphthongs or triphthongs. Can you identify the vowel sounds? [e] (like "name") sometimes gets turned into a diphthong. Quick fix: Focus on singing and sustaining the first vowel sound ("eh") until the ending consonant. [i] (like "meet") can sound pinched in middle and upper registers. Quick fix: Keep your tongue up near the roof of your mouth and as far forward as possible. If you flatten your tongue or pull it back, it will sound muffled. If the sound is thin or piercing, it may mean the tone is too bright. [a] (like "father") tends to spread (at least here in Upstate New York!). Quick fix: Darken the vowel by thinking "aw" instead of "ah." Quick fix: Keep your lips from pulling forward. Focus on singing only the first vowel sound ("oh"), with rounded lips. [u] (like "boot") can get too dark. Quick fix: Be careful not to pucker. Keep your upper lip from coming down over teeth. Also, make sure your lower jaw doesn’t push forward as you sing. My choir has a tendency to sing sharp. Quick fix: Try having them darken their vowels a bit. To darken a vowel, increase the space inside the mouth. Keep your soft palate (the soft tissue behind the roof of your mouth) raised and be careful not to flatten out the back of your tongue (source). My choir has a tendency to sing flat. Quick fix: Try having them bring the sound forward. To brighten a vowel, bring the sound forward in the mouth. Sing a simple descending 5-note scale using the word "alleluia," which reviews several of the primary vowel sounds we use when singing: ah-leh-loo-ee-ah. One more idea: sing the phrase "Scoo-bee, Doo-bee" for an ascending and descending 5-note scale and end with "Doo" on the last note. Review these at the beginning of your rehearsal or in the middle as a quick change-of-pace activity. Have the choir echo you in the beginning (remember to speak higher in the voice), then, after they've learned them, simply point to a color and have them speak it together using their head voice. Another way to introduce pure vowels is to sing through a new piece on a neutral syllable ("oo," "oh," and "ah" work best; try "doo," "loo," "noh," "mah," or "pah"). Polish that vowel before switching to text. Return to a neutral syllable, as needed throughout the rehearsal process (source). Once you're singing with text, ask your older choir members to show (with their mouths) the first vowel they sing in a given phrase. (Sometimes, the responses are hilarious.) Once everyone is in agreement, ask your singers to breathe in with that mouth shape. This helps create a pure vowel sound right from the start. Use a slinky to remind the choir to sing with tall, vertical mouth shapes and create space inside their mouths. Take an old tennis ball and cut a slit in it. Make this the mouth and draw a face around it. Squeeze the sides of the ball to make the mouth open and remind your singers to sing with tall, vertical mouth shapes. 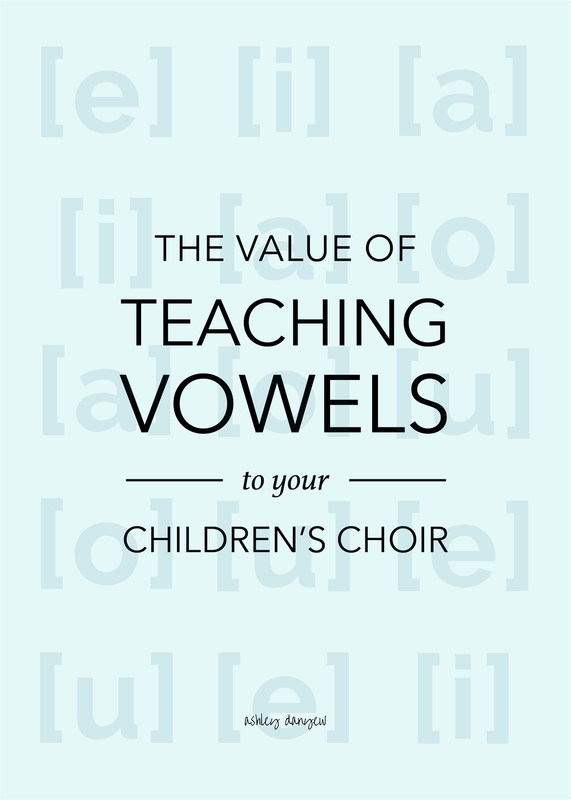 How do you teach vowels to your children's choir? Please share your suggestions and ideas in the comments below!